Several studies have recently pointed out the role of many inflammatory mediators in the progression of diabetes complications. 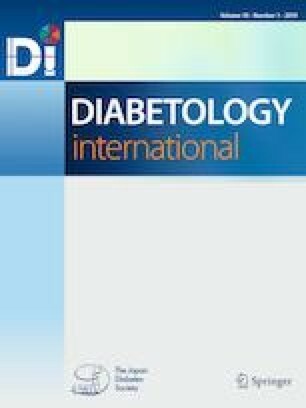 We had previously demonstrated that mRNA expression of platelet-activating factor receptor (PAFR) in peripheral blood mononuclear cells (PBMCs) was associated with urinary albumin to creatinine ratio (ACR) and forearm flow-mediated dilatation in patients with type 2 diabetes. In an attempt to elucidate this association, patients were followed up for 1 year. We recruited 95 patients from the hospital outpatient clinic, among whom 86 were followed up for 1 year (normoalbuminuria: 40 patients, microalbuminuria: 25 patients, macroalbuminuria: 21 patients). We then measured their baseline and 12 month characteristics and collected blood samples to extract PBMCs and measure gene expressions. Despite higher mRNA expression of PAFR in PBMCs among patients with macroalbuminuria, the rise in its value was not associated with biomarkers of nephropathy, while baseline values were not associated with progression of nephropathy. Moreover, changes in mRNA expression of PAFR were correlated with changes in ACR in all patients (r = 0.225, p = 0.037) and estimated glomerular filtration rate in patients with macroalbuminuria (r = − 0.438, p = 0.047) during the follow-up period. Our findings indicate that even though no causal relationship exists between diabetic nephropathy and elevated expression of PAFR in PBMCs, their close association signifies the presence of another common mechanism that could induce both events. Given these findings, the PAF/PAFR interaction could clarify corresponding mechanisms involved in diabetic complications. The online version of this article ( https://doi.org/10.1007/s13340-019-00394-w) contains supplementary material, which is available to authorized users. We wish to thank Joint Research Laboratory, Kagoshima University Graduate School of Medical and Dental Sciences, for the use of their facilities. We also wish to express our thanks to Kagoshima University Hospital clinical laboratory center, for the analysis of blood cells, and the laboratory research assistant Ms. A. Mihara. The authors would also like to thank the patients who took part in the clinical trial and the collaborators at the clinics. The authors would like to thank Enago (www.enago.jp) for the English language review. The authors declare no conflict of interest associated with this manuscript. All the procedures followed were in accordance with the ethical standards of the responsible committee on human experimentation (institutional and national) and with the Helsinki Declaration of 1964 and later versions. Informed consents were obtained from all participants for being included in the study. Sonkodi S, Mogyorósi A. Treatment of diabetic nephropathy with angiotensin II blockers. Nephrol Dial Transp. 2003;18 Suppl 5:v21-3. https://www.ncbi.nlm.nih.gov/pubmed/12817061. Accessed Jan 11 2019.